"On Amazon.com, on other sites, and at bookstores, you will see many different volumes on one topic and gigantic numbers on another. The first might be called personality career assessment; efforts in this area seek to connect the sort of person you are with a line of work. The second subject is the detailed strategies of job-seeking. Choosing a Lasting Career is neither. Instead, it fits between these two categories"
"What you need most to get hired are a) specific (not general) experience, and b) being personally liked by the interviewer"
"Very few jobs are lost by choosing the wrong reasonable interview, résumé, or workplace behavior tactics"
"More than any other consideration, it is essential that people deciding among careers be aware of the future situation, not the nature of the past or even the present"
"Many people graduating college this year will be 27 in 2018, and numerous new high school graduates will be 23, hardly optimal horizons for their career planning"
"Regardless of the independence in American national character, the great majority want, and are better suited, to work for others"
"In all, with 32 years until Ray Kurzweil’s projected Singularity date of 2045, the Prevail scenario seems most likely. If that holds, then while technological improvement will affect almost all areas of our society, it will not dominate. Most likely, we will still have jobs and careers, though the number of people in them will drop precipitously"
"What is the American dream, anyway? If you ask ten people, you might get ten different answers, but they would be related. But one thing would come through. Few would mention wanting to be given things. Even the patent 19th-century exaggeration of American streets being paved with gold did not imply that anyone could pick it off the pavement." "No longer will the number of American jobs approximate the number of those who can work them." "Automation and scalability each damage the connection between work and consumption; their combination destroys it." "We would have to look quite hard to find employers complaining that they cannot find enough young, poor, inner-city-dwelling workers because so many are incarcerated." "Why should human beings make sacrifices for opportunities that will not be forthcoming? Poor does not mean stupid." "Other factors that subtract a year and a half from life expectancy are often treated as epidemics. Could a shortage of work constitute the same?" "Who can train anyone to live in America on the $300 to $400 monthly that call center workers earn in India?" "Expecting to dominate a gigantic country with thousands of years of history would be beyond foolish." "Our ideologies themselves may be as valid now as applying philosophies to the placement of Titanic deck chairs - both futile and irrelevant." "Full employment in the United States of America is over." "If we maintain the idea that any decent person has the opportunity to work, our nation will be devastated. All that will be determined will be what form that will take." "All should realize that the number of older Americans seeking and working in career positions may increase exponentially over the next two decades." 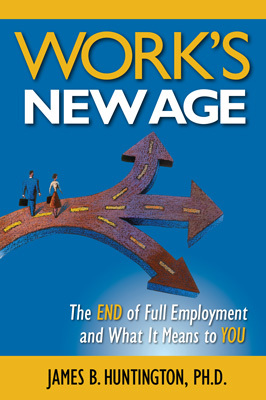 "Many aging baby boomers will not want to work in careers. Some will not be healthy enough. Some will marshal their resources toward working as little as possible. Some will have had their fill of more responsible positions and will choose other lifestyles. But it is likely that a significant proportion of the 76,000,000 will want a choice other than bagging groceries or watching television."